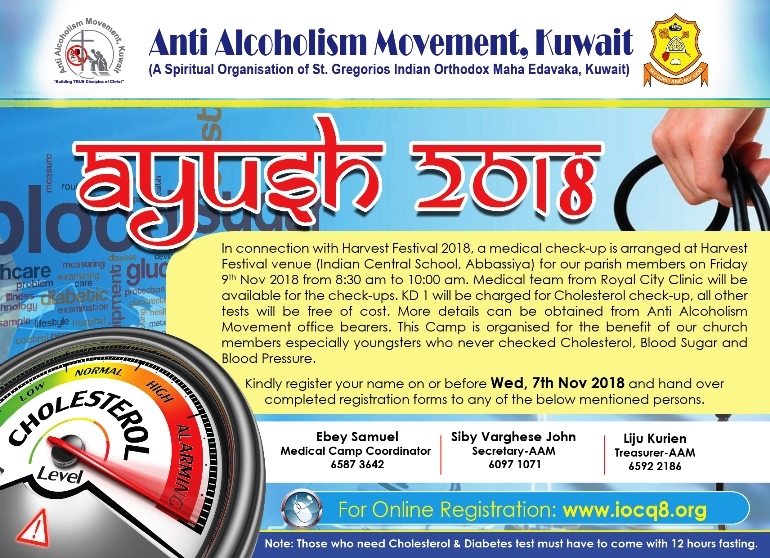 AAM is organizing a medical Check-Up Camp at Harvest Festival venue for our parish members on Friday November 9, 2018 from 8:30 am to 10:30 am. 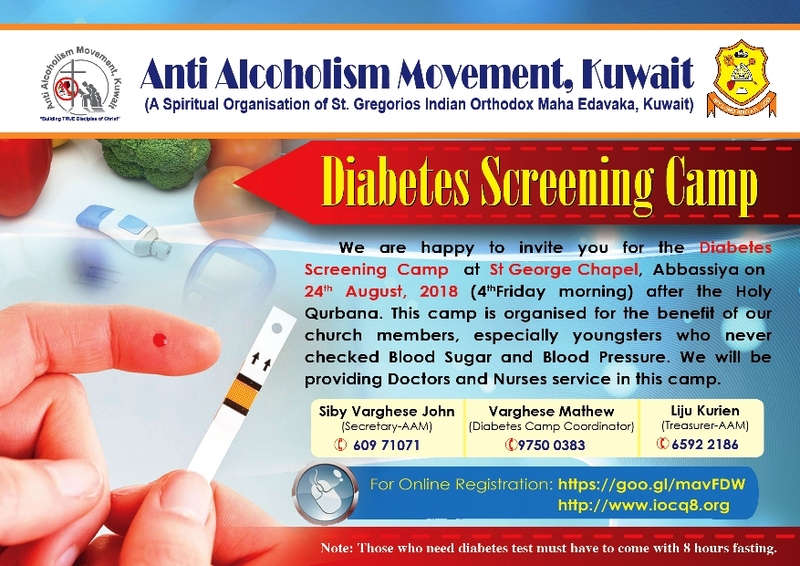 AAM is planning to conduct a half day diabetics screening camp on September 28th, Friday after the Holy Qurbana at St. Mary's Chapel Salmiya. We welcome all parishioners to attend this camp. 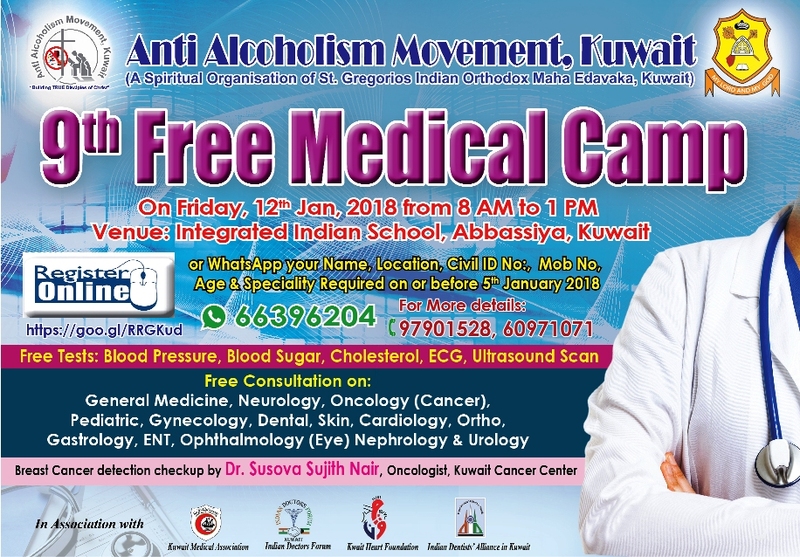 AAM Medical Camp on Friday 12th January 2018. We are happy to invite you for the Diabetes Screening Camp at St George Chapel, Abbassiya and St Mary�s Chapel, Salmiya on 23rd June, 2017 ( 4th Friday) after the Holy Qurbana. This Camp is organised for the benefit of our church members especially youngsters who never checked Blood Sugar and Blood Pressure. 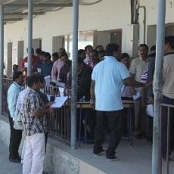 We will be providing Doctors and Nurses services in this camp. Kindly register your name on or before 18th June 2017 and hand over completed registration forms to any of the below mentioned persons. 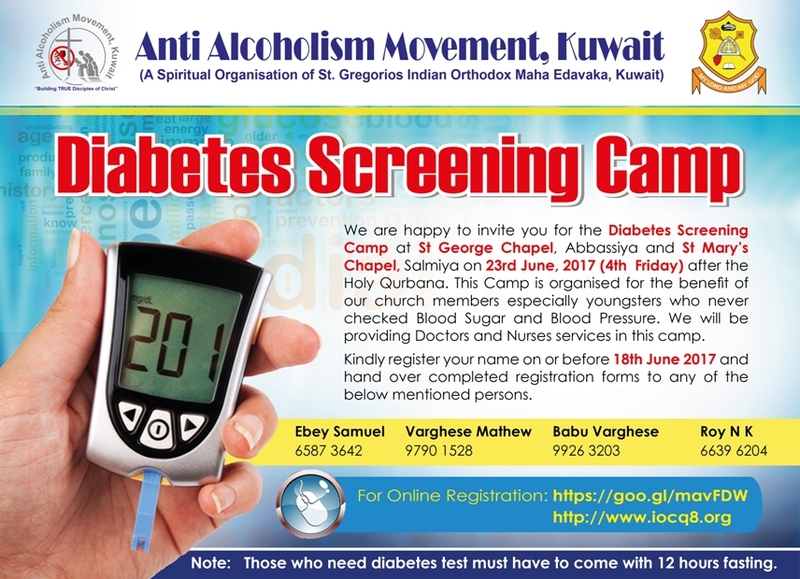 Note: Those who need diabetes test must have to come with 12 hours fasting. 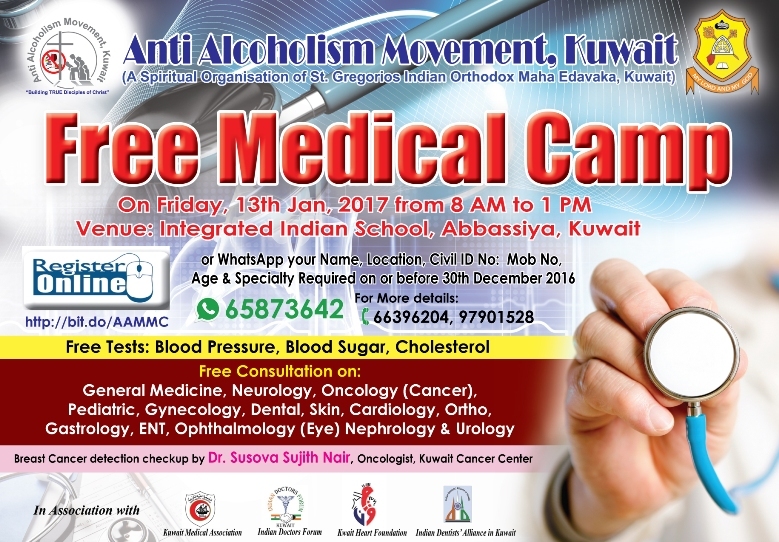 AAM 8th Medical Camp on Friday 13th Jan, 2017 from 8 AM to 1 PM at Integrated Indian School, Abbassiya, registration last date 30th Dec, 2016. 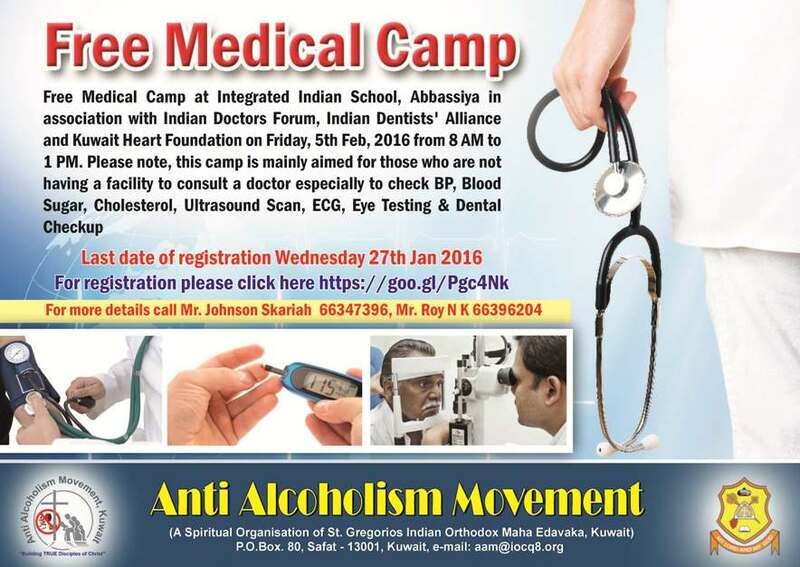 Anti Alcoholism Movement is planning to conduct the 7th Free Medical Camp at Integrated Indian School, Abbassiya in association with Indian Doctors Forum, Indian Dentists' Alliance, Kuwait Heart Foundation and with the support of many paramedical companies on Friday, 5th Feb, 2016 from 8 AM to 1 PM. 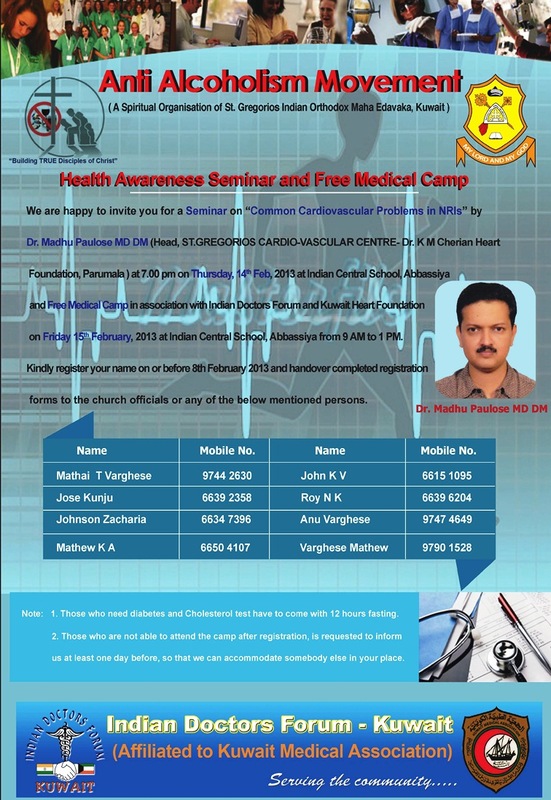 Please note, this camp is mainly aimed for those who are not having a facility to consult a doctor especially to check BP, Blood Sugar, Cholesterol, Ultrasound Scan, ECG, Eye Testing & Dental Checkup. 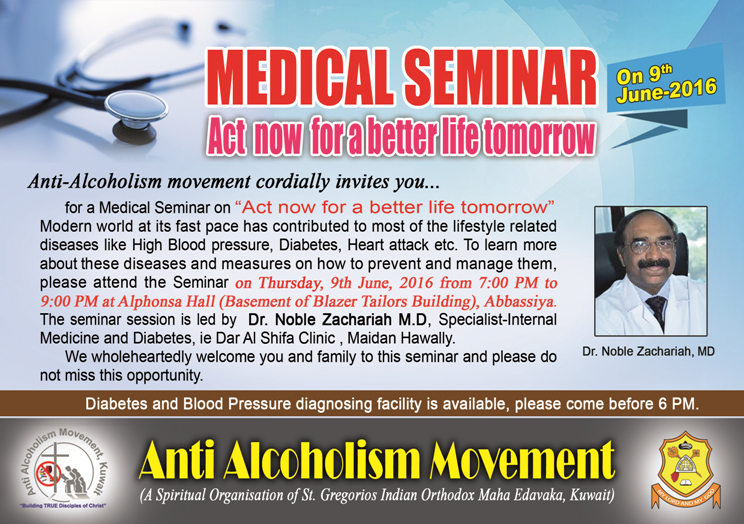 So we request you to convey this message to your house maids or anyone who needs a medical checkup. 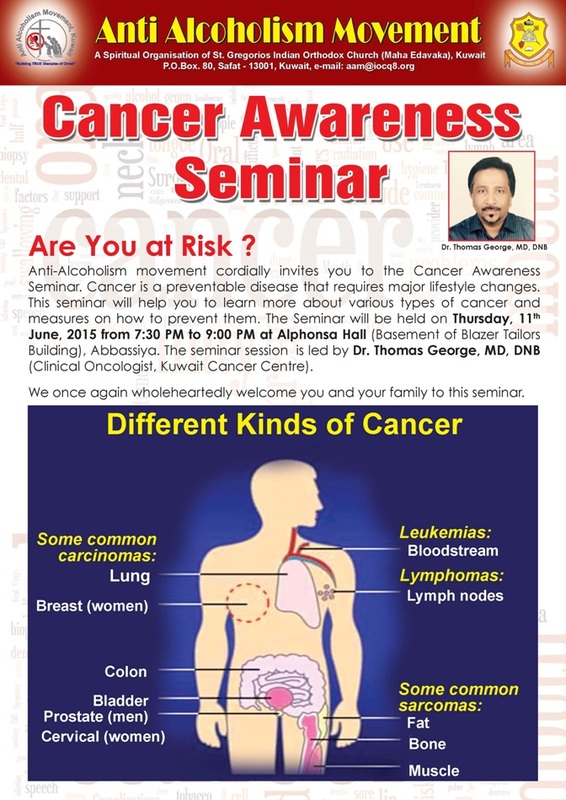 Anti Alcoholism Movement of St. Gregorios Indian Orthodox Maha Edavaka organizing Cancer Awareness Seminar by Dr Thomas George, MD, DNB (Clinical Oncologist, Kuwait Cancer Centre) on Thursday 11th June, 2015 at Alphonsa Hall from 7:30 PM to 9:00pm. 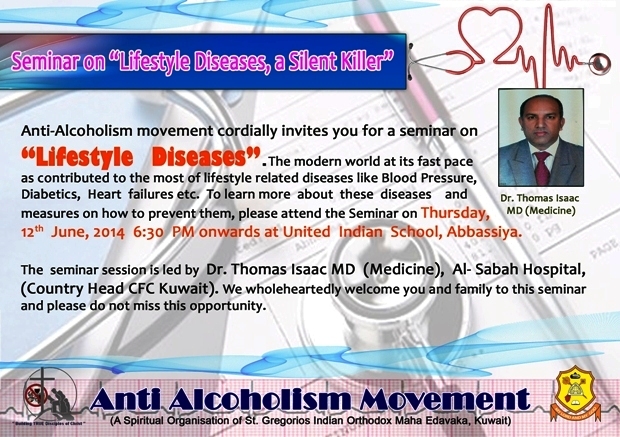 Medical Seminar on "LIFE STYLE DISEASES"
Anti Alcoholism Movement of St. Gregorios Indian Orthodox Maha Edavaka, Organising a medical seminar on "LIFE STYLE DISEASES" on Thursday, 12 June, 2014 from 6:30 PM at United Indian School, Abbassiya. 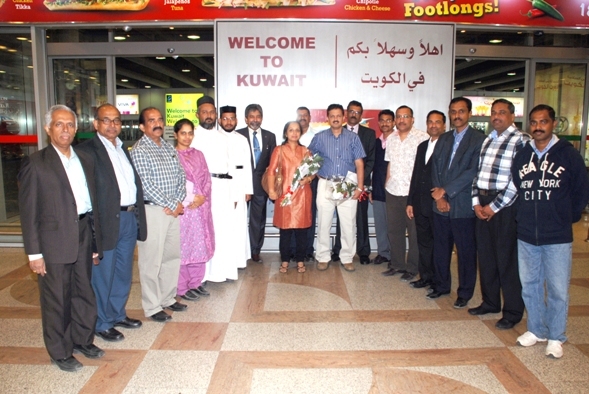 Seminar led by Dr. Thomas Isaac MD (Medicine), Al-Sabah Hospital, (Country Head CFC Kuwait). 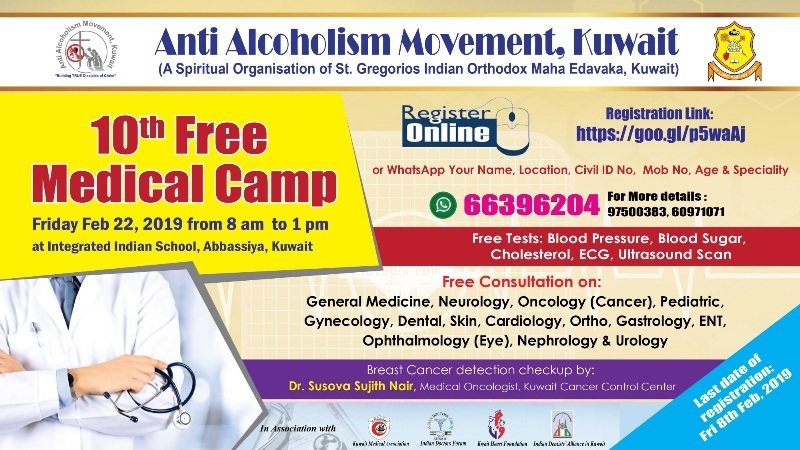 Anti Alcoholism Movement of Kuwait St. Gregorios Maha Edavaka of the Malankara Orthodox Syrian church is organizing a seminar on the topic �Enlightening the Family by Effective Parenting� to address these issues on Thursday, 9th January, 2014 from 7:00 PM at United Indian School Abbassiya. The seminar is expected to cover all aspects of family life, the care and concern of parents, growth and development of the child, life style, character formation, marital life and so on. Another Seminar on the topic �Enriching the Mind and Spirituality� is arranged for the benefit of MGOCSM members on Thursday, 16th January, 2014 from 5:00 PM to 6: 45 PM at NECK. 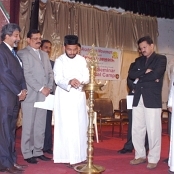 Both the Seminars will be lead by Rev. Fr. 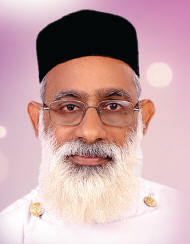 Johns Abraham, Director of Omax Counseling & Training Center, Kottayam. Achen will be available for individual counseling sessions for parents and children from Friday, January 10 to Wednesday, January 15, 2014. 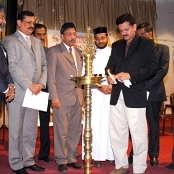 Director of Omax Counseling & Training Center, Kottayam.